I do not have any ties to Garmin so any comment I make about this product is purely my opinion based on using it on flights. I would appreciate hearing about your experiences with the unit. I just tried out my GDL 39 3D with my Garmin Aera 796 and I have to say I’m amazed. I was already impressed with the many wonders and magic of the 796’s capabilities and the weather/TFR information that Sirius XM Weather provided. But now, in addition to more weather products than I was getting with the basic XM package, the GDL 39 3D also provides Notam D for any airport I’m interested in. It also adds an Attitude and Heading Reference System (AHRS) in the form of an on-screen attitude indicator, Wide Area Augmentation System (WAAS) accuracy, and Automated Dependent Surveillance Broadcast (ADS-B) Air-to-Air traffic. If/when you get ADS-B out in your aircraft, you also get the Traffic Information Service Broadcast (TIS-B) Uplink information. Out of the box, my 796 provided touchscreen access to what is now standard aviation GPS functions including flight planning, user defined waypoints, standard VFR and IFR charts, Vertical Navigation, Terrain & Obstacle information, 3D vision, and a document reader for checklists and user manuals. 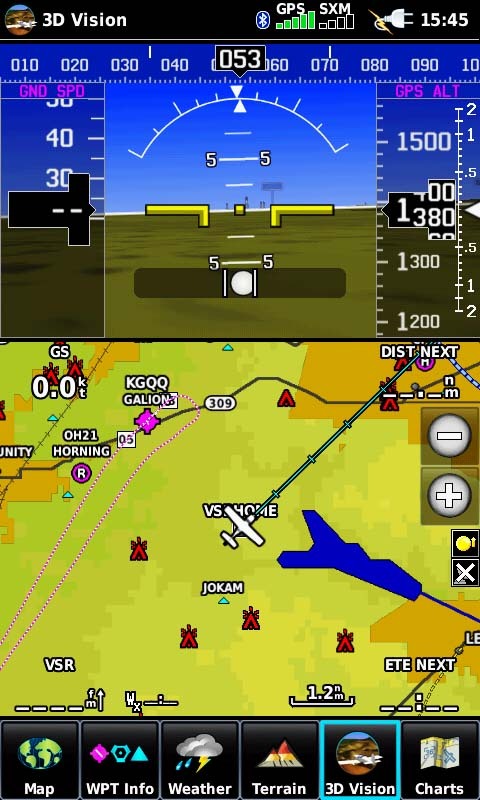 Because I have AOPA airport data, all I have to do is either touch the airport on the screen or enter its name or identifier and all the information about the airport is displayed including frequencies, approaches, field elevation, runways, traffic pattern altitude, weather, and so much more. With the XM Weather receiver plugged into the unit and a paid subscription, I can see at a glance in-flight which airports reporting weather are VFR, Marginal VFR, or IFR. By simply tapping on one of those airports, I can get the latest ceiling, visibility, wind speed and direction, and altimeter information. Along with the METAR, I can also reference the TAFs. 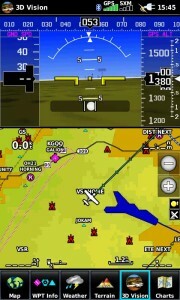 This was all very helpful when I flew VFR from Ohio to Florida last year. 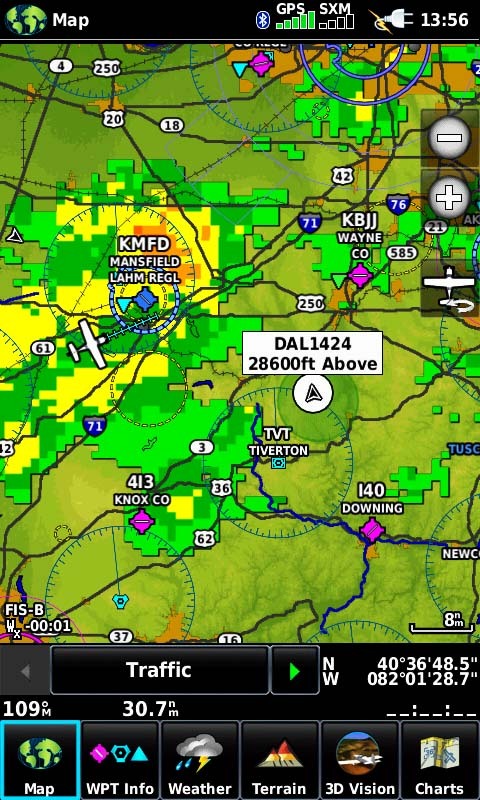 XM provides NEXRAD and other weather products regardless if I’m on the ground or in the air. The GDL 39 3D does not require a subscription (my basic XM service ran about $480 per year), provides more weather products and accesses additional features. With Flight Information Service Broadcast (FIS-B), I now receive NEXRAD, Winds Aloft, Temps Aloft, METARs, TAFs AIRMETs, SIGMETs, TFRs, and PIREPs. The system also provides current NOTAM-D information for each airport. In general, you shouldn’t expect to get weather information until you are in the air and receive a ground station signal. However, I live about 15 miles from the nearest ground station and can receive its signal most days. The receiver’s 3D Differential and WAAS now makes my 796 even more accurate in showing my location with an accuracy of 16 feet when seeing 6 satellites and 8 feet when the receiver sees ten satellites! The GDL 39 3D provides information to my 796 that drives an electronic attitude indicator that is now integrated with the other electronic instrument representations of a turn rate indicator, directional gyro/Horizontal Situation Indicator (HSI), vertical speed indicator, altimeter, and ground speed indicator that can be depicted as either analogue or digital. The GDL 39 3D also provides Air-to-Air (does not require you to have ADS-B out) and/or Traffic Information System Broadcast (TIS-B requires you to have ADS-B Out) traffic information. According to the Garmin manual, the TIS-B data link has a five-second update rate so, similar to the weather information, the display is not real-time but always has a delay. 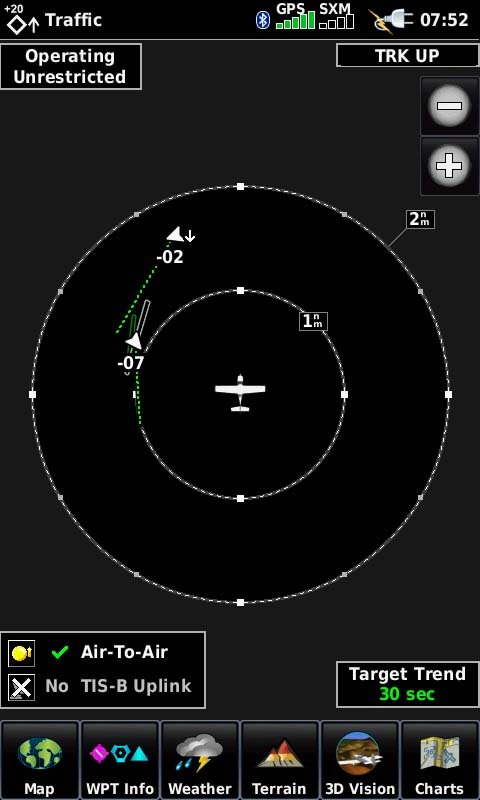 The aircraft targets you see are further along in their track/altitude change than depicted. How much depends on their speed. 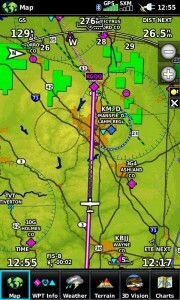 To somewhat compensate for the delay, the Garmin unit provides altitude trend and path trend information. More about that later. On a recent VFR flight with Flight Following, I was easily able to visually locate aircraft in 6 miles and haze that ATC was calling mainly because of being able to reference the target’s location, altitude, direction of travel, and projected path on the 796’s screen. The other aircraft reported they were unable to see me. There were aircraft that ATC called that did not show up on my screen because I don’t have ADS-B out yet and there were aircraft that popped up on my screen that ATC did not call out to me. 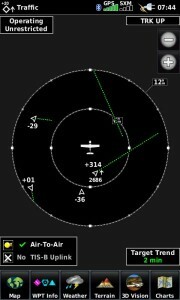 The bottom line for me is to keep an eyeful vigilance outside the cockpit and use ATC and the GDL 30 3D/796 combo as tools to augment my visual scan. So now that you’ve read the overview, here are a few specifics on the traffic feature of the unit. On the map screen of the 796, traffic is represented by a moving arrowhead icon. There is also a dedicated Traffic screen. The traffic screen can be setup to show traffic within a 0.5 nm ring with your aircraft in the center. You can also choose to see traffic within two concentric circles of the following nautical mile distance combinations: 0.5&1, 1&2, 2&6, 6&12, 12&24, or 24&40. This screenshot shows an example of traffic within the 6 nm and 12 nm rings. The green dotted line associated with each target is an example of the Target Trend feature. The line shows the projected path over the next 2 minutes. The shorter line indicates a slower aircraft. The target with a -29 indicates an aircraft that is 2900 feet below my altitude that is not climbing nor descending at or above 500 feet per minute. The target with a +01 indicates an aircraft that is 100 feet above my altitude. 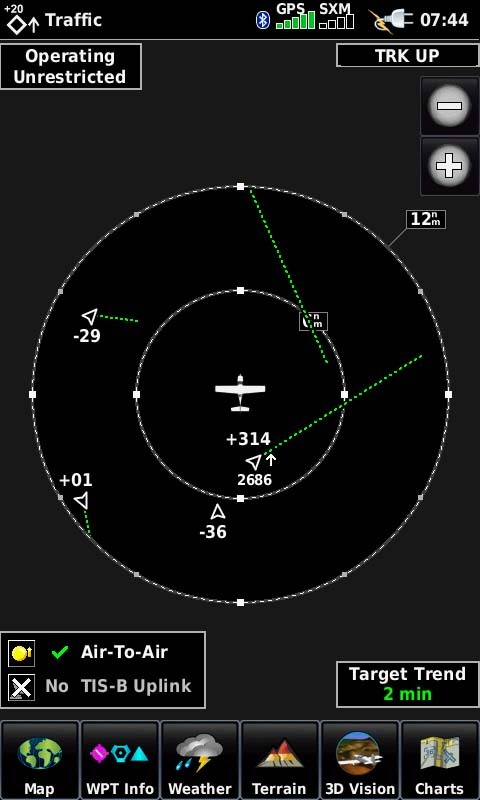 The target near the center showing +314 and an up arrow next to it indicates an aircraft that is 31,400 above my altitude and climbing at or above 500 feet per minute. Where you see a green dotted line (upper right) with no target, indicates an aircraft that will entering the 12 nm ring based on its projected path. There is an altitude filter that gives you the option of not limiting the altitude of aircraft depicted on the screen (Operating Unrestricted) which allows you to see airline traffic. 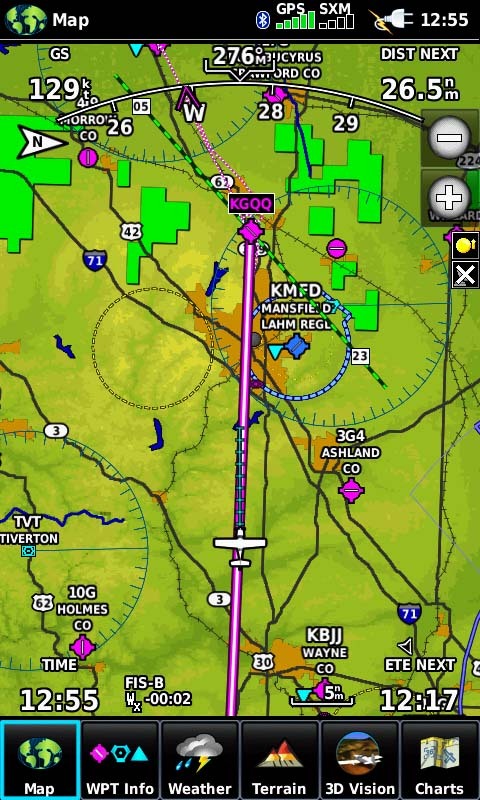 Although I haven’t yet been able to find documentation to confirm this, I believe that choosing Normal mode only shows aircraft 3,500 feet above and 3,500 feet below your current altitude; Above mode restricts the targets seen to those operating above your altitude; and Below mode restricts the targets seen to those operating below your altitude. On a recent flight, the Aera 796 coupled with the GDL 39 3D showed targets on the taxiway as I flew overhead. Note the runway depiction. There was one paved runway (white outline) and a grass runway (green outline). The targets also show up on the map screen. If you want more information about a particular target on the map screen, you simply touch the icon. In this example, the traffic is not specifically identified with a tail number, is 2,500 feet above my altitude and climbing. The weather depicted may have some of you thinking that I should not have been flying in it. Not to worry, I was safe at my desk when I took this screenshot. Note the colored flags at the weather reporting airports. 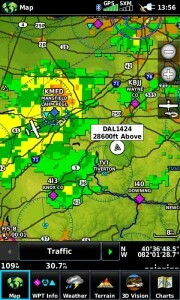 Blue/VFR, Green/MVFR, Yellow/IFR, Red/ Low IFR. Here is another example of the map screen with weather and a target. This one is Delta Air Line 1424, level at 28, 600 feet above my altitude on the ground at home. Finally, I wanted to show you a few more screenshots taken at my desk. This is an example of the 3D Vision screen. 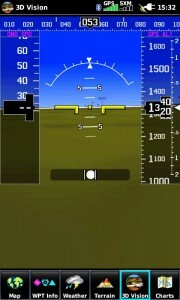 Similar to a glass cockpit, the ground speed tape is on the left, the altitude and vertical speed indicator tapes are on the right, the heading indicator is on the top. The attitude/bank indicator is centered and the slip/skid indicator is on the bottom. 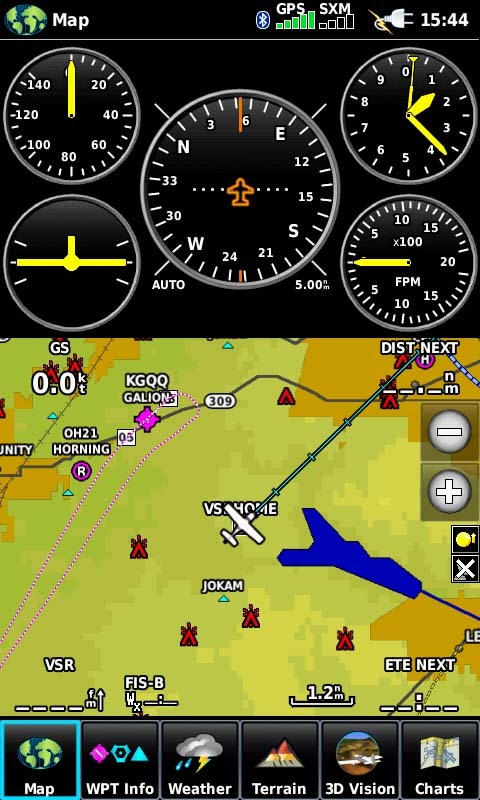 Here is a sample of the split screen with the digital flight instruments and the map (taken on the ground at my desk). 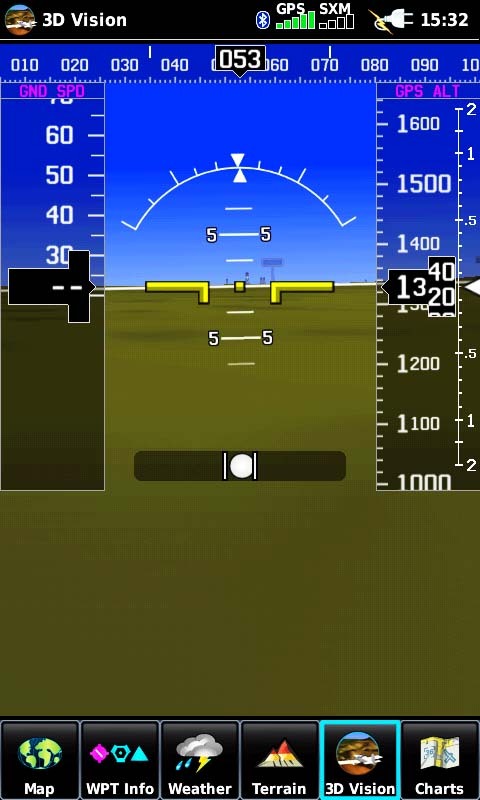 Here is a sample of the split screen with the analog flight instruments and the map (taken on the ground at my desk). Would you say that the product has been worth the investment? I have read that you need to re-adjust the 3D Vision screen after some time period, once in flight. Have you experience this.? Not sure what you are referring to. The Artificial Horizon can be readjusted to compensate for when the GDL39 3D is sitting on an angle. I do have a RC Allen Electric Attitude Indicator, and once in awhile it drift to one side or to the other, so I have to cage it to re-adjust, I wonder if the 796 in 3D view with the gdl39 3d drift inflight and have to be re-adjust. Choose flight plan; then select add a way point up pops the waypoint history page where you can search and inject waypoints. however I can’t delete the way point history. I’m not sure what you mean by deleting a waypoint history. You can delete the entire flight plan or you can delete individual waypoints in the flight plan. 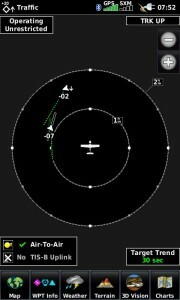 To delete individual waypoints in the flight plan just tap the waypoint you want to delete then tap the menu icon which will provide many prompts. Tap the prompt Remove Waypoint. Does that answer your question?